The instant ship panel and pole display boards are our most resilient panel and pole display system. Manufactured with high quality materials, each aspect of these Universal display boards is tailored to ensure they are as effective as possible for you. We design and manufacture a range of different kits and each can be customised further in order to adapt to your environment and content. All of the panel and pole display boards featured below are available for instant-ship, which means they are guaranteed to be shipped to you within 24 hours of your order (excluding weekends). 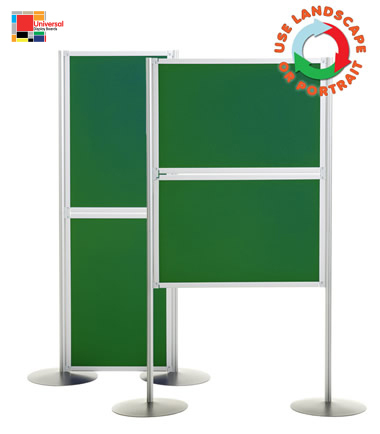 These panel and pole display boards are designed primarily for use indoors. We manufacture the panels and poles for use in areas with a moderate amount of footfall and each is equipped with round stabilising feet for additional security.